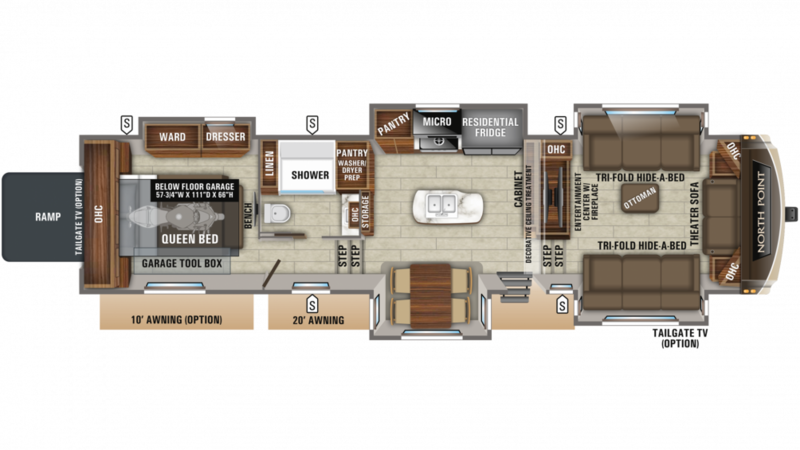 Travel the country in comfort and style with the 2020 Jayco North Point 385THWS! This 5th Wheel Toy Hauler will wow your family and turn heads! And, it's available for an outstanding, low price at All Seasons RV! We're number one in customer satisfaction and one of the largest RV dealers in the Midwest! You can stop by our lot at 4701 Airline Rd Muskegon Michigan 49444 or call us at 231-739-5269 to talk about our 24/7 store-to-door delivery service across North America! 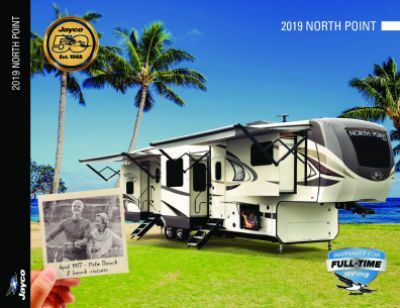 The 2020 Jayco North Point 385THWS handles well on the road, thanks to a hitch weight of 3456 lbs. and sturdy GVWR rating of 19000 lbs. The 20' 0" patio awning opens easily for shade and comfort outdoors! It's a real pain to run to the woods or the disgusting campground bath facility every time you need to go. You won't have to deal with those problems anymore, as this RV comes with a private bathroom! Inside you'll find a sink vanity, Porcelain Foot Flush toilet, and a shower! With 60 lbs. of LP tank capacity, you can enjoy hot water all vacation long! With the 74 gallon gray water tank and the 37 gallon black water tank, you can enjoy your vacation without dealing with any bathroom-related issues! You can transport your toys straight to the campground with the 9' 3" long garage. With a cargo capacity of 3650 lbs, this toy hauler can haul your heaviest toys and luggage.